Acrobatics (from Greek Akros, high and bat, walking) involve movements that are a combination of difficult feats of balance, agility and coordination that often utilize apparatus such as tightropes, trapezes, unicycles, balls, barrels, and/or poles. The performance of acrobatics requires quick reactions, and accurate timing. While considered to be a performing art, it is also practiced competitively as a sport. Acrobats were greatly admired in ancient China, Egypt, and the Minoan civilization. Tightrope walkers were honored in ancient Rome. At fairs during the Middle Ages, tumblers performed somersaults, back flips, and other tricks to entertain large groups of people. Acrobats' feats leave most viewers in awe of the individual's ability to engage their bodies in seemingly impossible actions. Acrobats seem to defy all physical limitations with their extreme actions and fearlessness. Nearly any activity which involves full-body movement propelling an individual through air and space can be considered acrobatics. Acrobatics is a specialized activity that is incorporated into gymnastics, diving, and dance in the form of tumbling and other movements such as flips, somersaults, headstands, and handstands. The term "acrobatics" can also refer to "acrobatic gymnastics," or "sport acrobatics," a specialized subdivision of gymnastics, which is a competitive sport in its own right. Acrobatics is a versatile sport or activity that can be suited to boys or girls and requires little or no equipment other than a gym mat, a trampoline, or even just a backyard. Acrobatics can improve strength and overall body conditioning when done safely. Acrobatic traditions can be found in many cultures throughout the world and throughout history. In the West, Minoan art from circa 2000 B.C.E. contains depictions of acrobatic feats on the backs of drawings of bulls. 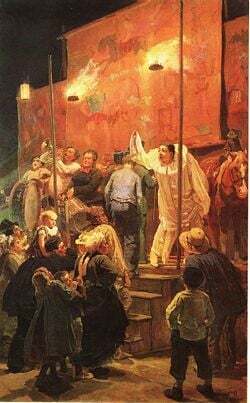 The court festivities of the European Middle Ages would often involve acrobatic performances along with song, juggling and drama. The invention of the flying trapeze (1859) and the exploits of Blondin and Farini, who in 1859 and 1860 walked on tightropes across the Niagara gorge, took acrobatics literally to new heights. Additionally, acrobatics received a new venue with traveling circuses and the modern dance halls of Vaudeville. Acrobatics in Western history has been a popular subject for fine arts. An example would be Acrobats at the Cirque (Francisca and Angelina Wartenberg) by Impressionist Pierre-Auguste Renoir which depicts two German acrobatic sisters. The painting currently resides at the Art Institute of Chicago. 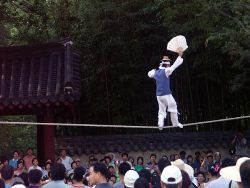 In China, acrobatics have been a part of the their culture since the time of the Western Han Dynasty (206 B.C.E.-220 C.E.) which boasts artifacts such as brick paintings, murals and pottery figurines featuring headstands, handstands and somersaults. Acrobatics were an essential part of village harvest festivals. 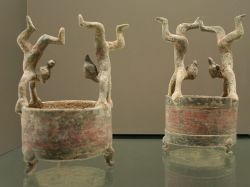 Two Vases Decorated with Acrobats, Terra Cotta, Western Han Period (206 B.C.E. – 9 C.E.) displayed in the Cernuschi Museum, Paris. 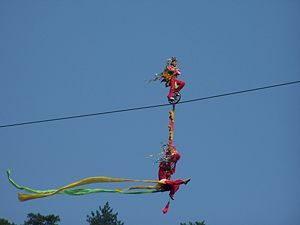 During the Tang Dynasty (618-907) acrobatics developed along similar lines as European acrobatics did during the Middle Ages. A lacquer painting on a bow dating from the Tang Dynasty, which is now housed in Japan as a national treasure, shows a man supporting a long pole on his head with six people performing aerial stunts. Acrobatics was an integral part of the Italian commedia dell'arte of the Renaissance when acrobatic stunts were tests of strength and agility. Later it came to be an Eastern European specialty characterized by exhibitions of great strength. The appearance in the West of the Peking (Beijing) Circus in the 1970s profoundly altered Western perceptions of acrobatics; the Chinese stressed lightness more than strength. Chinese acrobats also introduced humor into their acts. 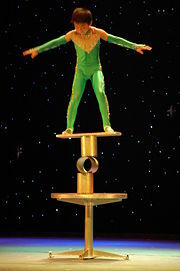 More recently, in the 1980s, Cirque Du Soleil added a narrative, or background theme, to the acrobatic routine. The acrobats of Cirque du Soleil, dress in unusual costumes and make-up and bring a dimension of surrealism, symbolism and character study to their performance that clearly elevates acrobatics to an art form. Traditionally, acrobatic skills and knowledge was kept within a family and passed from parents to children. This is still true, especially among family circus groups. However, most acrobats are currently taught by larger scale education systems, as circuses are now made up of many more professionals than previously. Many schools specializing in acrobatic art have become a constant source of new artists. Some of these schools are independently operated, and some are supported and affiliated with the circuses themselves. When learning acrobatics it is necessary to start out with the more elementary moves in order to secure a foundation of solid skills and strength training. Every move requires planning and student should plan for safe recovery, using spotters and partners for correction and feedback. Moves that can be properly planned for are: 1) safe falls—learn to land on the balls of the feet with knees slightly bent, and 2) increase the area of contact rather than falling on a hand or elbow, 3) learn to forward roll and backward roll as a means of recovery. Attitude is extremely important when executing difficult moves as is working in conjunction with partners and as part of a team. Warm-ups, while an important part of any physical fitness routine is particularly important with acrobatics. One should always begin with calisthenics and a complete set of stretching exercises. Becoming familiar with the basic positions first, such as straight or extended hand stand, pike, straddle and tuck, is advisable. Other positions include: split, stag, scale, and frontal balance. The sequence of skills should be learned in their order of difficulty. In acrobatics, as in any challenging sport, confidence is built along with mastery. 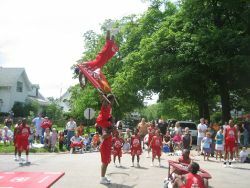 The Jesse White Tumbling Team performing during the 2007 Milk Days parade in Harvard, Illinois. The first use of acrobatics as a specific sport distinguishable from formal gymnastic disciplines, was in the Soviet Union in the 1930s. The International Federation of Sports Acrobatics (IFSA) was founded in Moscow in 1973, and the first world championships were held there the following year. United States Sports Acrobatics (USSA), founded in 1975, is now an associate member of USA Gymnastics, and the IFSA was absorbed by the International Gymnastics Federation (FIG) in 1999. Acrobatic Gymnastics are judged in five categories: Men’s pair, Women’s pair, Mixed pairs, Women’s group (trio), and Men's group (quadruples). Typically tumbling consists of three series of acrobatic elements performed on the run, including somersaults and handsprings. The five types of events are choreographed to music. They can involve dance, tumbling and/or “partner skills” which can in turn involve “balance” and “dynamic” skills. Dynamic skills involve some form of aerial maneuver, while balance skills involve poses and holds. Sometimes called 'Sports acrobatics' the term now officially used is 'Acrobatic Gymnastics'. ↑ Red Panda Acrobats, San Francisco - History Redpanda2000.com. Retrieved June 14, 2018. ↑ Tang Dynasty Acrobatics ChinaCulture.org. Retrieved June 14, 2018. ↑ Characteristics of Chinese Acrobatics Chinaculture.org. Retrieved June 14, 2018. ↑ History of Acrobats of China Acrobats of China. Retrieved June 14, 2018. ↑ Stan Buchholtz, Balancing and Sport Acrobatics (Arco Publishing, 1978, ISBN 0668043962). ↑ Competition description International Gymnastics Federation Retrieved June 14, 2018. ↑ About Acrobatic Gymnastics International Gymnastics Federation Retrieved June 14, 2018. Acrobatics leaps to new heights Chinadaily.com.cn. This page was last modified on 27 July 2018, at 15:58.